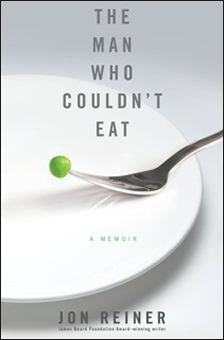 The Man Who Couldn't Eat is named a 2011 "Top Pick" by The Los Angeles Times​ and The Chicago Tribune. A gifted food writer details his battle with Crohn’s disease. Winner of the 2010 James Beard Foundation Award for Feature Essay, Reiner expands his gripping article that first appeared in Esquire in 2009. With the spirit and edge of a seasoned sports announcer calling a fight, the author graphically depicts both the cumulative effects of two decades of living at the mercy of chronic illness and the staggering play-by-play of a recent life-threatening episode when his guts literally exploded. In this engrossing and candid memoir, James Beard Award–winning writer Reiner tells of his doctor's orders following a diagnosis of a torn intestine: eat nothing. Reiner, who at age 46 had a history of Crohn's disease, gets even more bad news when emergency surgery results in a severely infected abdomen, among other complications, that force him to get his nutrition intravenously. "As a piece of writing, it's fearless and singular." This compelling audio edition of Reiner’s fascinating and heart-wrenching memoir features an inspired and intimate performance from narrator Dan John Miller. "A conversation readers won’t want to end." Jon Reiner couldn’t fathom a life without food, until one measly dried apricot caused him to collapse on his kitchen floor, buckled over in pain from a ruptured intestine. Despite a history of Crohn’s disease, Reiner—a self-described “glutton in a greyhound’s body”—didn’t deprive himself until, at 46, he was hooked up to an intravenous drip with an infected abdomen and no choice but to follow his doctor’s orders: don’t eat. "An adroitly rendered meditation on desire, deprivation, and our complicated relationship with food." It sounds preposterous, but Jon Reiner, the James Beard-winning food writer who penned Esquire's "How Men Eat" series, was once himself unable to eat. "Unlike any food memoir you've ever read."